Scanning Process: All film conversion processes include film inspection, cleaning, and repair. We repair old splices, remove blank film and film too damaged to transfer, and replace the leader if necessary. Prior to scanning your film, we carefully clean it with a special solution to remove dust, mold, and other contaminants from the film stock . 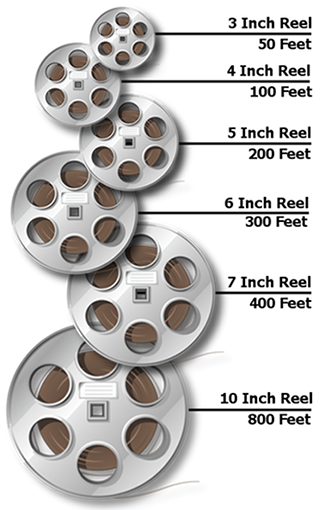 We use high definition film scanners (MovieStuff models Universal-Retro and Sniper) to digitally scan and record the entire contents of each frame of your 8mm, Super 8mm and 16mm film. The captured film content is then reformatted and converted into two (2) new digital formats. DVDs are standard definiton video (720x480 resolution). High definition formats have 1920 x 1080p resolution, in a 16 x 9 aspect ratio, at 18 to 20 frames per second (fps) for silent film and 24fps for film with sound tracks. Our film scanners' frame-by-frame scanning of each film frame provides a superior, flicker-free movie. For data files, each film reel is transferred to its own data file. Please number your reels, or we will do this for you. The returned files are labeled as 01, 02, 03, etc. If ordering data files, we can return the files via the Web, on your storage media, or on storage media purchased from Cintrex AV. If ordering less compressed files such as Apple ProRes, please send in storage media, or purchase media from Cintrex. Pricing: Film Transfer Pricing varies, depending upon your 2-format selection. From Jason Ross of St. Louis, Missouri on 1/8/2019 . From Sue Ridge of Flushing, Michigan on 7/6/2018 . Well done. Efficient. And very customer friendly. Helpful to guide customer and done on time. Work turned out well and original returned with the new; effort made to make sure we would be home when it was delivered. From Terry of Florissant, Missouri on 11/1/2017 . Wonderful work done in a timely manner! From JOHN STREITER of VERONA, New Jersey on 7/24/2015 . Good Service. Good results from 40yr old film. From Tom K of St. Louis, Missouri on 6/8/2015 . I just wanted to thank you again for everything you guys did in transferring our family film log onto Blu-rays and onto my hard-drives. Last weekend we had a reunion for the remaining cousins and everyone thoroughly enjoyed watching the old films. I appreciate the time you took with me during the transfer process, listening to my wishes and changes while walking me through the details in a manner I could understand.